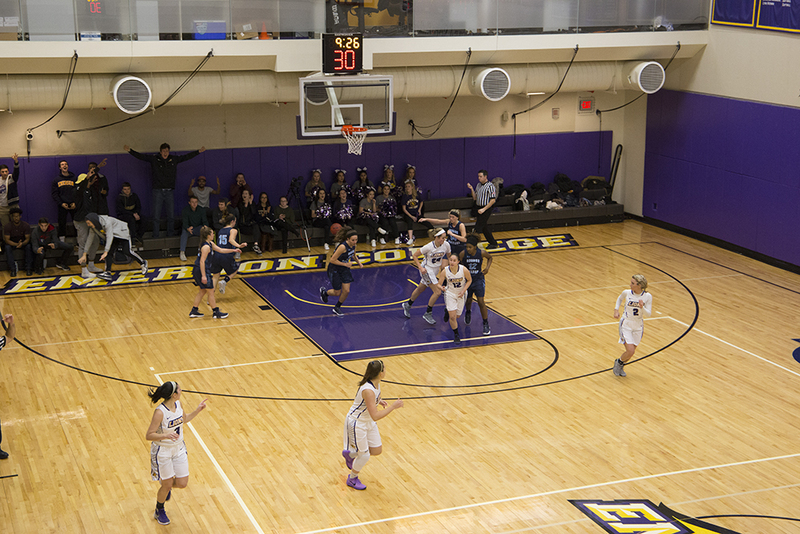 Emerson's women's basketball team opened its season with a 90-71 win over Gordon. Emerson’s women’s basketball team hopes to reach the playoffs this season by using its versatility and changing the pace of the game, according to head coach Bill Gould. The Lions lost three players from last season’s roster, including forward Sierra Ducey, who started in every game last year. Elizabeth Horan, the only senior from that squad, drained 54 three-pointers at just over 36 percent, ranking third and fifth in the NEWMAC, respectively. With only three players standing 5-foot-10-inches or taller, two of whom are freshmen, Emerson lacks in height compared to the rest of the NEWMAC this year. Those who earned playoff spots in 2017 enter this season averaging six players at least 5-foot-10-inches, according to team rosters, while those who didn’t average two. Gould said his group can make up for its lack of height. While Emerson is traditionally a man-to-man team defensively, Gould said he plans to employ more of the 2-3 zone as well as a 1-3-1 three-quarters trapping press in hopes to speed up the game. Conditioning during the offseason was important for the Lions to combat the physical demands of playing faster. Senior guard Eastin Ashby said the team has done more conditioning in the preseason this year than in the past. Looking ahead on the schedule, Emerson hosts d3Hoops.com’s national preseason no. 1 ranked Tufts on Nov. 21. NESCAC foe Middlebury finished fourth in its conference and will also face the Lions early in the year. “The NEWMAC is a very competitive conference, so playing teams like Tufts is definitely going to help, especially having them in the beginning and being able to fall into your season,” Ashby said. Gould said he has high expectations for the four new freshmen on this year’s roster. One of the freshmen, forward Sam Boyle, is the younger sister of junior forward/center Charlie Boyle, and the pair is reunited after two years playing apart. The elder Boyle is coming off a campaign where she earned Second Team All-NEWMAC honors, and is 371 points away from a 1,000 point career. Boyle scored 311 and 318 points in her first two years while averaging 12.7 points and 6.4 rebounds per game as a sophomore. Entering his 11th year at Emerson, Gould said he is excited and has high hopes for the season. Emerson won its season opener 90-71 over Gordon and will look to defend home court this weekend as it takes on Middlebury and Ave Maria at its annual Tip-Off Tournament.